match is impossible. What are good matches? > match is impossible. What are good matches? I would not be without a riser thingy that we got from Hobby Lobby. 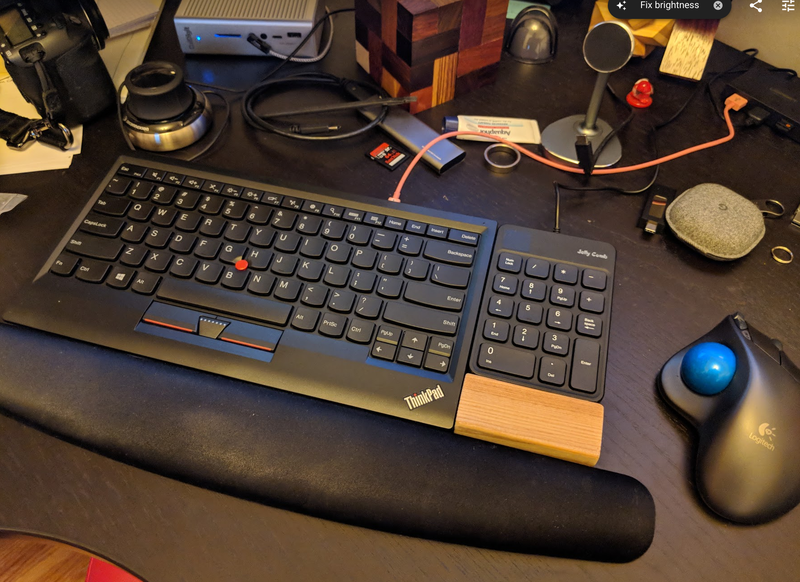 Long story short, I don't believe there's a full sized keyboard out that that mimics the keys on any of my ThinkPads any better than what Lenovo has to offer under the ThinkPad branding. Having had an X220 previously and doing the same hunt back then, I can say the same for the classic style keys. Bluetooth is a little harder to find, but it exists. Tip: Rubber feet of various sizes is crucial to making this work for me. it's FRU 55Y9091, but I don't know where you can find them. You may like one of the "contour roller mouse" alternatives. mouse buttons), and use x2x to control the desktop! taller chair, raised desk, and raise the monitors! > Bluetooth is a little harder to find, but it exists. > Tip: Rubber feet of various sizes is crucial to making this work for me. > screen. Solution? External keyboard and raising the laptop. additional display to see how the ergonomics are.